Beecher Terrace is about to change, but will it really solve the problem? This month, the federal department of Housing and Urban Development (HUD) awarded a $425,000 Choice Neighborhoods planning grant to the Louisville Metro Housing Authority (LMHA) in the agency’s efforts to revitalize the Beecher Terrace public housing complex and surrounding Russell neighborhood. There’s no confusion surrounding Louisville’s feelings towards Beecher Terrace, and public housing in general, but what might not be as clear is how or if Choice Neighborhoods differs in any real way from the deeply criticized HOPE VI program, and why “mixed income” always necessitates displacement. For Choice Neighborhoods to be a successful program, it will have to overcome the deep theoretical and real-world implications of its predecessor, the HOPE VI program, and its ideological forefather, urban renewal. Choice Neighborhoods will have to address its problematic equation—and central ideology—that investing in the physical environment can “solve” deeply rooted, long-ignored, historical inequalities. Implemented in 2003, the Housing Opportunities for People Everywhere (HOPE VI), came out of a national study by HUD to investigate the quality of its public housing stock. The commission reported that six percent of the country’s housing stock was in distress—roughly 86,000 units out of 1.4 million at the time. The response was a program of relocation, demolition of existing stock, and limited reconstruction of on-site units. Tenants that did not return on-site were given Section 8 vouchers to move to outlying areas. According to HUD, the goals of HOPE VI were to revitalize the physical shape of public housing, lessen concentrations of poverty through the creation of mixed income communities, and to forge new public-private partnerships to leverage support and resources. Transform distressed public and assisted housing into energy efficient, mixed-income housing that is physically and financially viable over the long term. Support positive outcomes for families who live in the target development and the surrounding neighborhood, particularly outcomes related to residents health, safety, employment, and education. Transform neighborhoods of poverty into viable, mixed-income neighborhoods with access to well-functioning services, effective schools and educational programs, public assets, public transportation, and improved access to jobs. These goals are meant to build upon those of the HOPE VI revitalization program implemented in earnest between 2003 and 2010. Louisville’s current redevelopment of Sheppard Square and the transitions of Clarksdale Homes into Liberty Green and the Cotter Lang Homes into Park Duvalle were part of the HOPE VI program. HOPE VI, while touted as a success by HUD, local housing authorities, and city officials, has shown little in the way of proven results. Proponents have pointed to the new physical design of mixed-income communities, innovative new funding sources around public-private partnerships, and innovative new management systems as milestones of success for the program. Opponents point to its method of resident dispersal to scatter impoverished individuals and families across the city to areas often with less transit options, poor access to social services, and into more impoverished situations less visible to the larger community as indicators of its failure. Edward Goetz has documented the many problems with HOPE VI, and displacement programs in general in his seminal work, New Deal Ruins: Race, Economic Justice, and Public Housing Policy. A recent study by the Urban Institute showed that displaced residents were often moved into areas with lower poverty. Those areas in turn retained higher rates of poverty than the rest of the city on average. Those areas also showed significant increases in poverty before residents arrived and continued to show increases after. Out of sight, out of mind. And in this case, the more atomized the poverty the harder it is to show in the data. Some research, such as a 2007 study by Popkin and Cove, has shown minimal quality of life improvements and small gains in residents’ perceptions of safety. Authors such as Goetz question whether or not this perceived benefit is equivalent to the goals of the HOPE VI program itself or worth the uprooting, displacement, and uncertainty associated with displacement strategies. One of Goetz’s critiques of displacement programs is that relocated residents simply do not experience more economic security, by way of income, earnings, or employment opportunities—a central goal of HOPE VI and other displacement programs. A series of studies quoted by Goetz (Levy and Woolley (2007), Goetz (2002, 2010), Clampet-Lundquist (2004) and Curley (2010)) show that “moving toward opportunity” does little to quell discrimination in hiring practices, medical problems faced by housing residents, and only compounds issues of affordable/convenient child care, social capital, and racial discrimination. Choice Neighborhoods is a program based more on the interconnectivity of services necessary to support complete community change. The creation of mixed income communities through forced dispersal is still present, lending to the ideology that it is, in fact, the class makeup of the individuals within neighborhoods, rather than the physical infrastructure where they live. Disinvestment of the place itself is identified as problematic. Choice Neighborhoods does take into account that a full community plan, with significant resident input, is necessary for comprehensive change. The program also includes a significant element that its predecessor did not: the consideration and planned implementation of of social services and public goods necessary for true neighborhood change. These services include “access to well-functioning services, effective schools and educational programs, public assets, public transportation, and improved access to jobs.” Finally, the Choice Neighborhoods program also extends eligibility to privately owned, federally subsidized developments. Choice neighborhoods seems like a step in the right direction with its focus on multi-sector actors and community needs, but the question remains, why not simply invest in the spaces and community already present? Physical improvements to the built environment alone cannot be the primary remedy to entrenched issues of social inequalities in our cities. Current policy interventions, such as Choice Neighborhoods are still deeply entrenched in a “place matters” ideology. Its central claim is that it isn’t, in fact, dysfunctional people, but places that need to be “fixed” by reinvestment strategies. 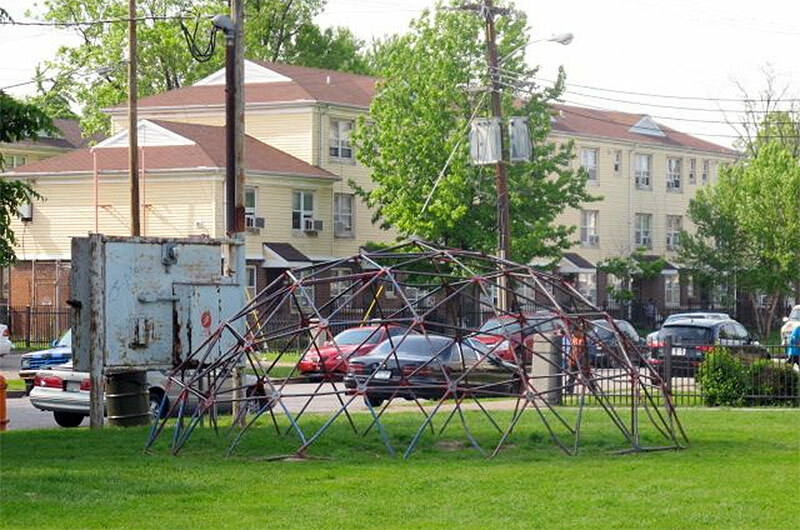 The Choice Neighborhood program’s insistence on the primacy of addressing a city’s physical issues comes at the expense of understanding the social processes that create those spaces in the first place. These programs often create a self-fulfilling prophecy by claiming that a positive change to the housing stock design and construction will equate to a better living condition for community members, and then focus efforts on displacing community members with the most economic insecurity and social needs, and replacing them with more financially stable tenants. There remains an almost pathological desire to avoid investigating the history and outcomes of past urban renewal projects. What were the conditions that led to a need for urban renewal, HOPE VI, and now Choice Neighborhoods? How can a simple updating of the housing stock (much like what was done during urban renewal) address these intersectional issues? Why don’t we investigate how these spaces came to be? Who benefits from our ignorance? These are the questions and challenges facing Louisville as the fate of the Beecher Terrace is decided upon.